Bihar board is now also soon going to release the Bihar Board 11th exam question paper for taking BSEB 11th 2018 examination. As per earlier year plan of Bihar board examination plan. As per school +2/ College BSEB 11th, the Class date will be released after the practical exam of Inter Bihar board finish. students around the Bihar state who study in the Eleven class they wish to know when Bihar board will be taken 11th class 2018 annual examination. Students can check much more details through the below links. Students who will participate in the exam they will be passed and promoted in the intermediate. Soon we will update the completed details-date and time for the students. Bihar board 11th Class students can contact their school or college for the more updated. Students are suggested to collect their Identity Card from the school. All school and Colleges will be issued the Student ID card which will need time to time. If you wish to know things about the 11th class exam of Bihar board then you can ask through the comments. Please Note: Every School College has been taking 11th Annual Exam From 16th May. Arts & Science Stream class Date – 18th May to 26th May 2018. 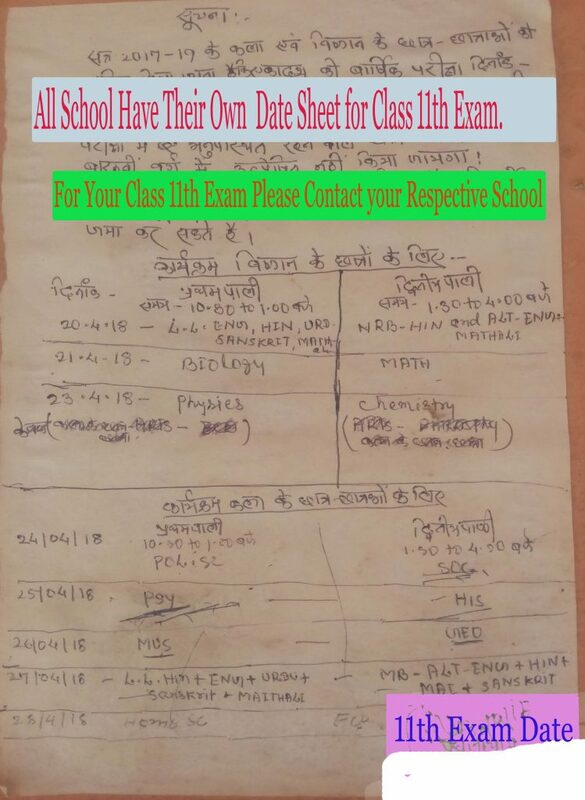 Bihar School Examination Board which is the educational board to conduct a huge number of students board examination and Check up exams like Sent up Test and Class 11th Test at the school from where students took admission. For academic Session, 2017-2019 Bihar board is started to conduct Class XIth Science and Class 11th Arts and Commerce students examination 2018. New Update:- Students of Class 11th suggested to contact their respective school, BSEB released the notification for conduct class 11th Exam 2018, Under the guideline of BSEB as per School/College own decided time/date. Students can join us on the Facebook for the latest information and update from the Bihar board, Visitors can also bookmark this page for easy open. For easy access to this website, students can bookmark this website. www.resultfor.in is the information partner of B. S. Inter College Karua Samastipur. From here students can take admission for intermediate and bachelor degree courses. 11 TH Ke exam ka routine kya h.tell me plz…..
Kai school me ho chuka hai. Aap Apne School se sampark kare .. Kyoki 11th ka exam har school apne exam program se lene ke swantantra hai.